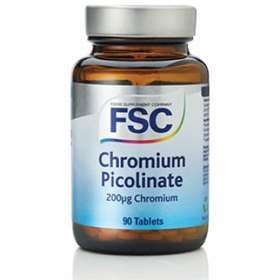 FSC Chromium Picolinate 200µg Chromium 90 Tablets For life styles that demand the monitoring of blood sugar levels and help stabilize blood sugar, chromium picolate promotes the stimulation of enzymes involved in the metabolism of glucose to help prevent hypertension or high blood pressure.As an essential trace mineral its reputation is known to help reduce body fat and increase lean muscle mass and may assist weight loss by helping to regulate fat absobtion and cholesterol. Helps the metabolism of fats. Swallow one tablet daily with food. Do not exceed the daily recommended dose. Cautions and Warnings: Keep supplements safely out of the sight and reach of children. Food supplements should not be used as a substitute for a varied diet and a healthy lifestyle. Diabetics/Hypoglycemics Use only under a Doctors supervision because this product contains Chromium which may enhance insulin sensitivity and may affect your blood glucose levels.